I get questions about colony raising all the time, frequently from people who are also interested in Beveren. 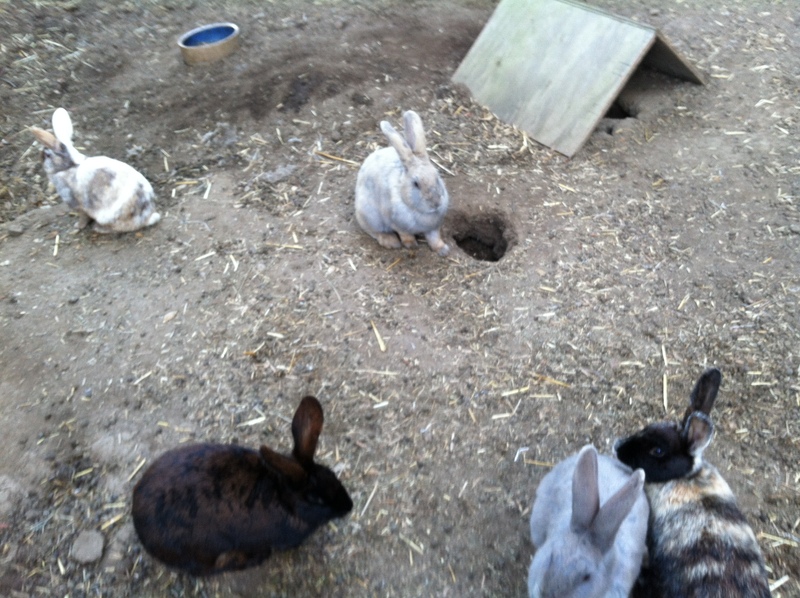 Since I raise 6 different breeds of rabbits its been interesting to note which ones do well co-housed in rabbit herds. Surprisingly, its the American. They are hands-down the most laid back and willing to get along with each other with very little scuffling. Its not to be said I haven’t had some roughed up does from a dominance struggle, I do, but they’re more willing to go along with the social order once established. Beveren are not what I’d recommend for a beginner. Mixing a few Beveren in there like I do might work but I notice when they ovulate they get cranky and can pick on the other rabbits. Not all the Beveren, just some. Beveren can be cage territorial sometimes too – an indication they have less tolerance for lots of competition. My Americans on the other hand seem to thrive in the social setting. Do not put your show animals into a colony and don’t ever introduce adults. In the colony there are sometimes scuffles – particularly if you take the lead doe or second in command out for breeding – the other does will quickly box each other to see who will take her place! A torn ear and mouthfuls of ripped fur do happen. The Harlequin do ok out there too but they sure are feisty. When the pecking order is established things seem to simmer down to peaceful. A boxing Harlequin is a sight to behold – enormous leaps in the air – they are the acrobats out of all my breeds. With their splashy colors, they’re natural performers. If Harlequins were people they’d be the gymnasts, Olympic track runners, and Cirque du Soleil performers. I kid you not. My mixed blood Belgians actually do excellent in the colony. I have not put my full blooded Belgian Hares into a colony setting. I will as my numbers recover from our crash last year. They’re pretty social and non-aggressive. My Belgian buck Jack had a particular fondness for the colony, and did really well in there. Unfortunately I didn’t PUT him in there!! He was a naughty boy. I stopped putting Hotots into the colony pen as they kept disappearing. I do not know why. They simply may not have run from overhead predators, I am really not sure. Rabbits have to be smart to thrive in the colony. We do not put bird netting over the entire rabbit pasture, just the core home area where the babies sometimes pop out of the ground. We have a new breed in our mix, the Silver Fox, so in the year to come will see how that breed does in the colony setting too. So far, they seem like a very laid back personality. We love the colony herd experience. Our girls seem to love it too. I wish we could raise them all this way. Note: do not put your rabbits in together like this unless they’ve been socially conditioned for warren living!! Raven and BeBe hanging in the sheep pen, settlers for the new outback colony! The established colony: that’s our new mulberry tree in the back pasture. Later this summer when the grass is done growing we’ll let them out into all the pastures. The plywood roof is over one of the main dens. We’ve come to accept that where there is rabbits, there will be no plants. 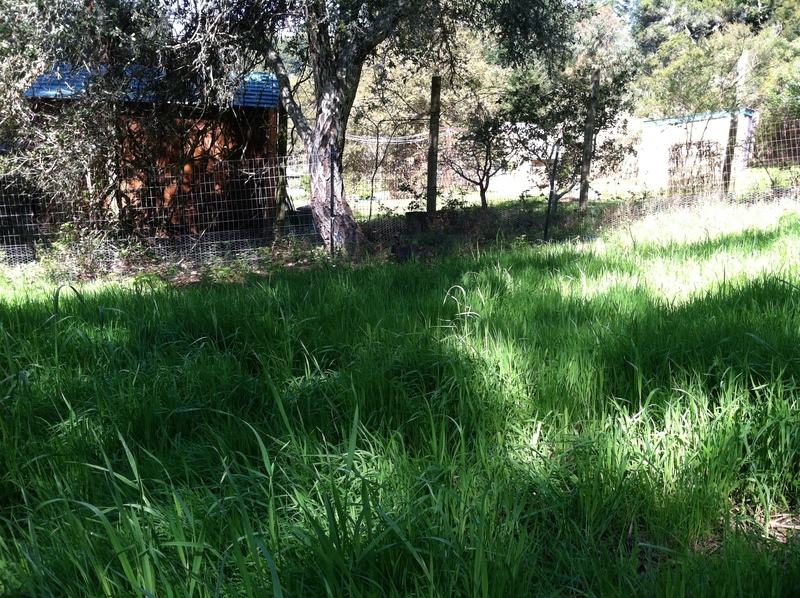 There are pastures to the left and forward of the main pen, that are fenced off to let the grass grow. The young litters squeeze through the fence and mow the grass without destroying it. We pick grass to feed the adults. 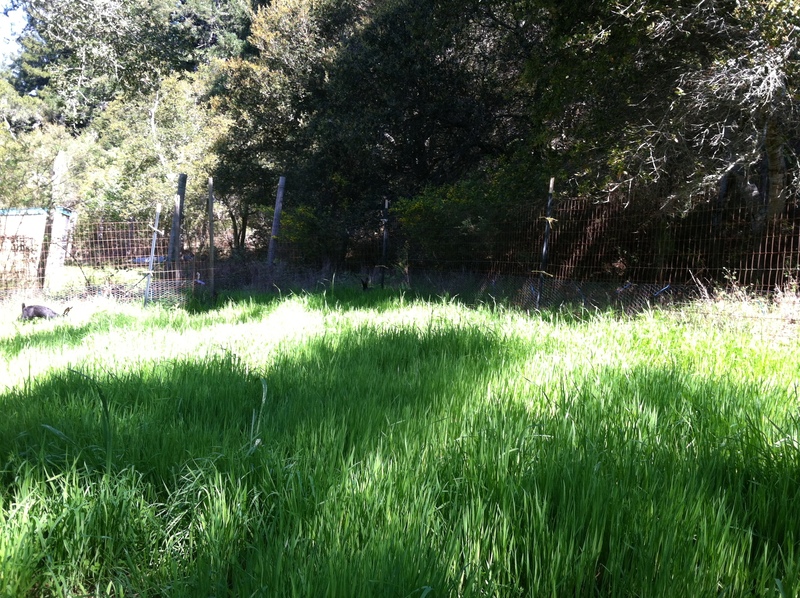 Later in the summer when the grass is done growing, we’ll open all the pastures to give them plenty of room to roam. We look forward to that mulberry tree to someday be big enough to harvest leaves, and the berries will fall into the pasture for the rabbits to eat. We keep its trunk protected. The rabbits have lots of dens, the plywood roof is over one of the main dens. 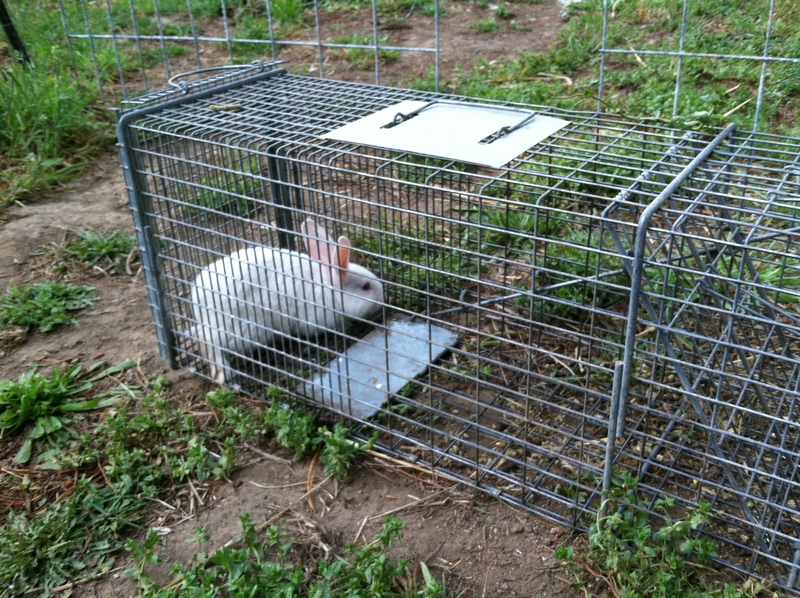 We were locking all the rabbits up at night in a 10ft x 4 ft structure when the foxes started coming around last Fall. They have given up on us for the time being and there are so many baby rabbits running everywhere anyways that won’t get into the structure that we figure our breeders are safe. 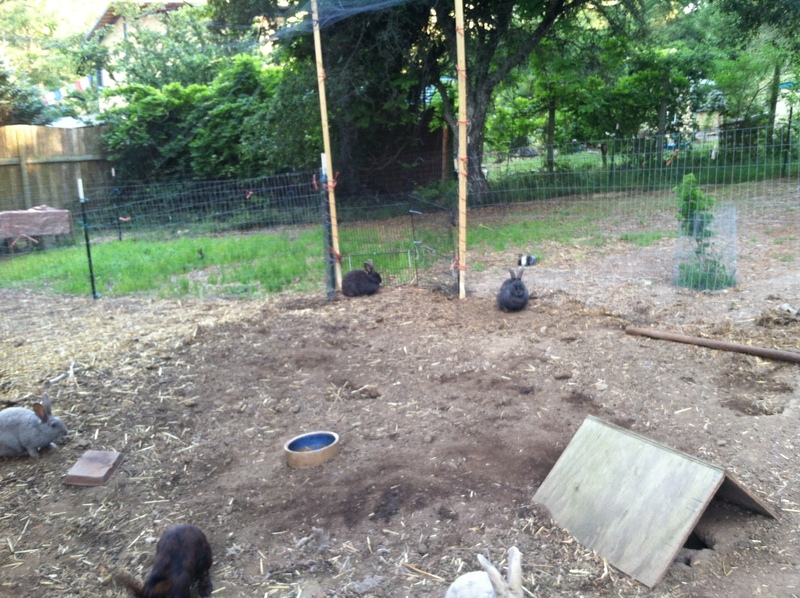 So far, so good, til the news gets out about all these Free Range Rabbits. 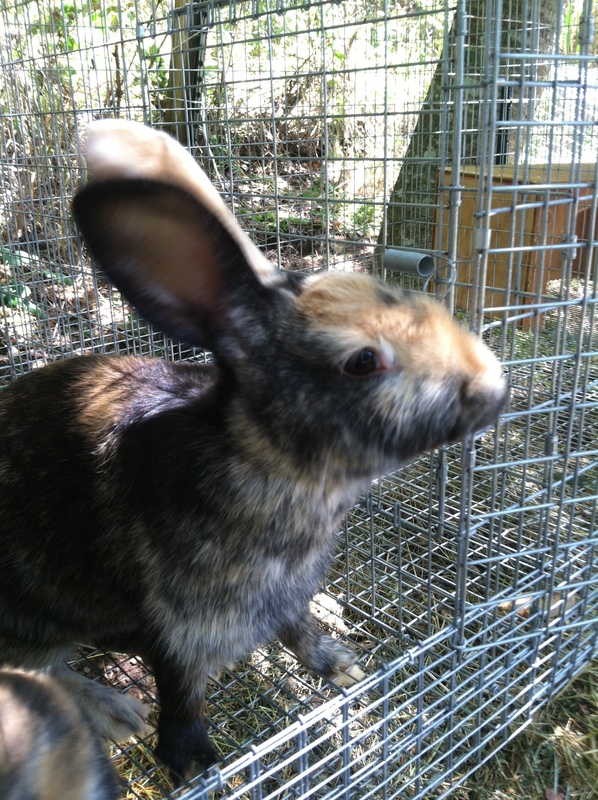 Caught one Free Range Rabbit! Please follow proper procedures for setting up a colony and don’t try to co-house territorial older does!! 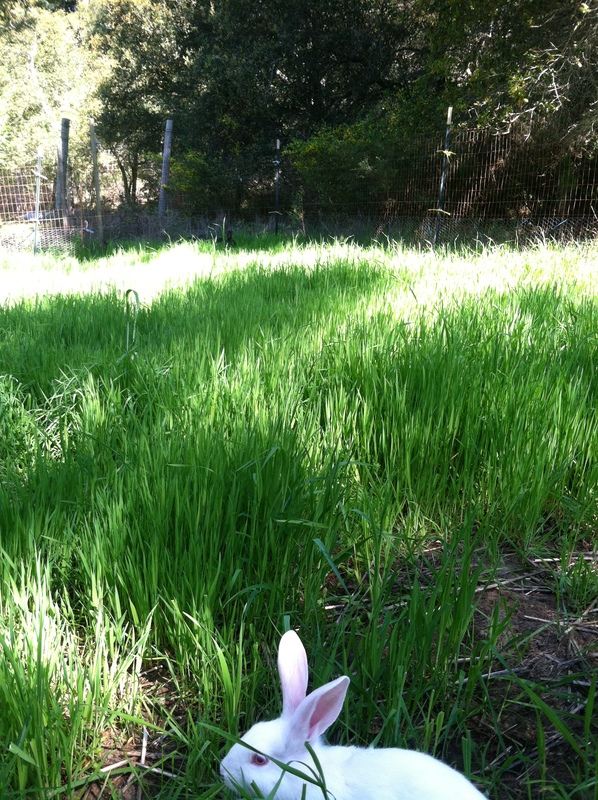 I love it when spring brings all the grass back to the pastures and the pasture rabbits get released! They have been cooped together all winter and today is first mow. The Americans are the lucky pasture rabbits. 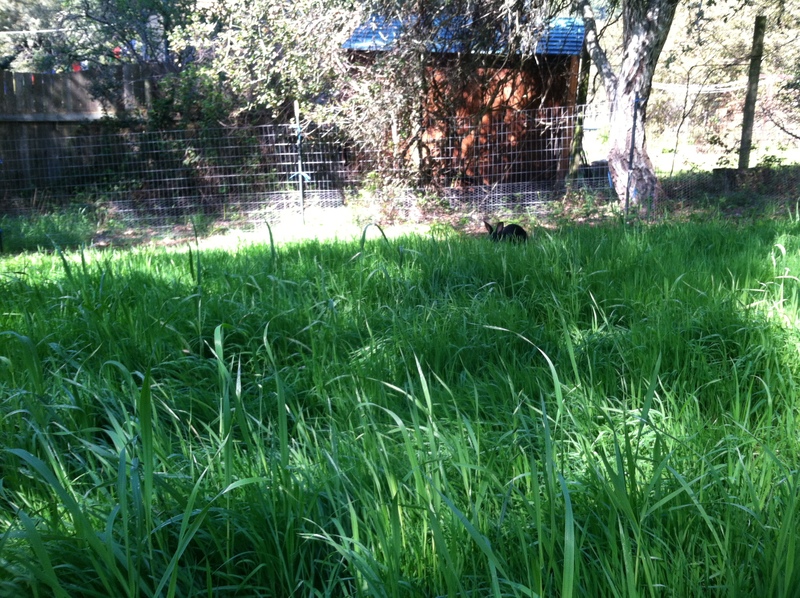 In each picture, can you spot the rabbit? 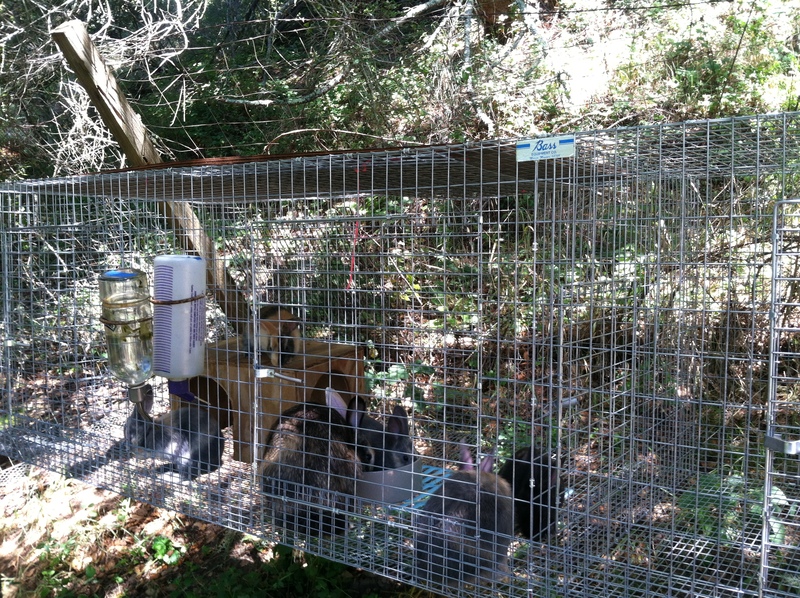 Here’s another look at the Harlequin colony cage. Pip and her litter are on one half of the 10 ft cage. As the litter grows I will section the boys off, keeping them together in a family unit, while also introducing the young Hotot doe to see if they’ll get along. She’s currently on the other half of the cage but quarantined in a smaller section. There is a door in the middle, see previous post. Pip shows off her new cage. Its 10 feet long, with a divider in the middle. The divider has a door in it, the spring latch is visible just above her forehead. This way I can introduce another young female on the other side (an Hotot, Bowie, is over there) and see if the two of them will get a long, before opening the door. Does typically scuffle for dominance for a couple days, and once they sort it out are best of friends. There are always exceptions however, for instance, Bijoux does not like other rabbits in her cage and will get grumpy towards her own offspring. I find its best to grow the colony herd with their own offspring – there is a family bond that remains with most. This custom designed cage also has two subdividers latched to the ceiling, in case in needs to be converted to compartments. 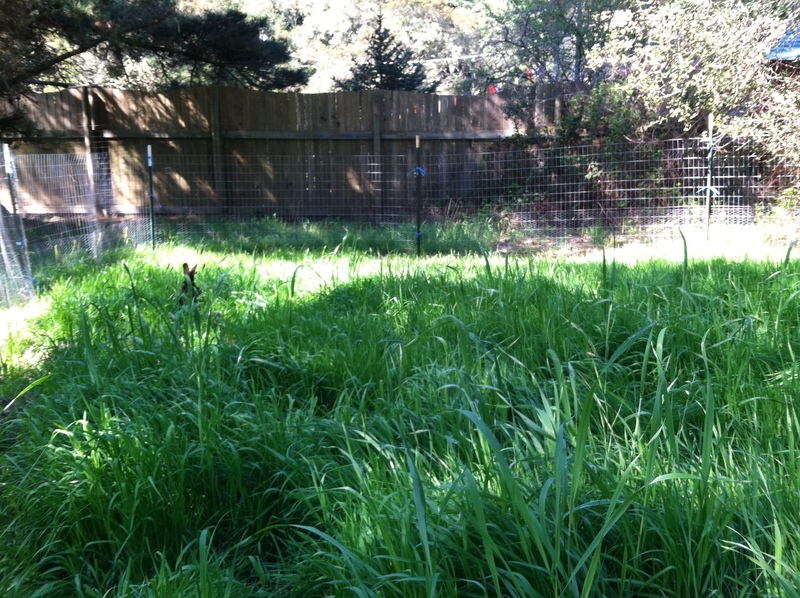 Its 30″ high to provide ample stretch space – bunnies love to stand on their hind legs and look around. 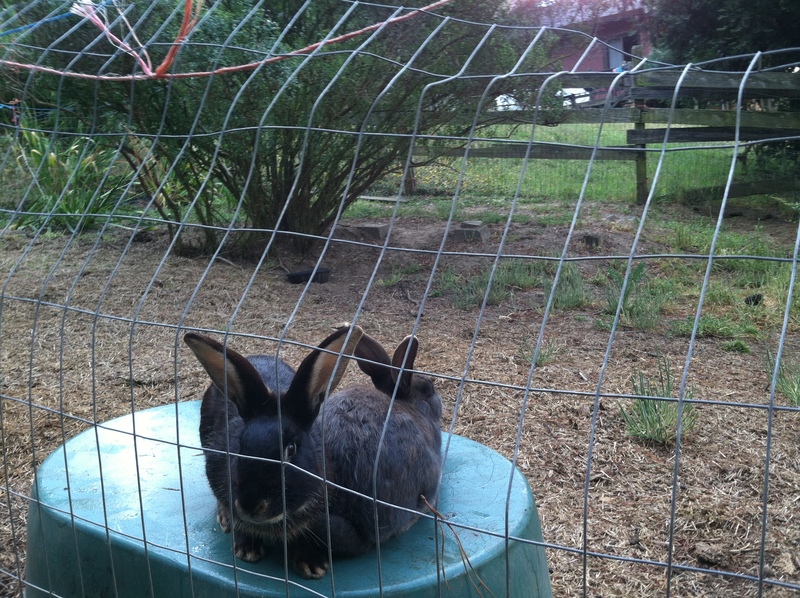 I provide playboxes for the bunnies to jump on, this exercises their muscles and keeps them busy. Receive infrequent updates to newsworthy activity on the farm!